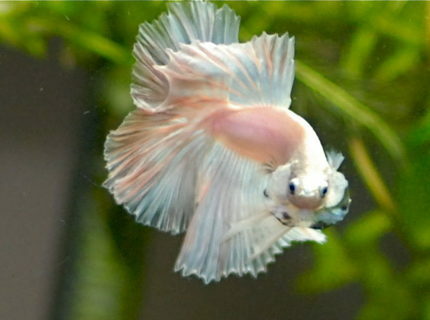 About Yourself: I had fish as a kid and always said I would get another tank as an adult. My husband finally purchased a 30 gallon for my birthday. That was in 1992. I have been hooked ever since. 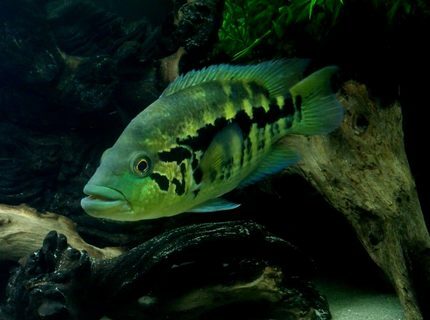 In the early days I kept a community tank and eventually decided that I loved the cichlids of South America. 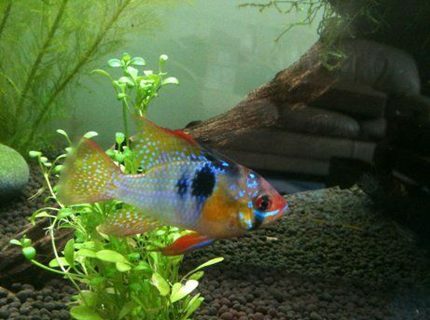 I kept dwarf cichlids for a few years and then moved to Angelfish. I have had some sort of Angelfish in my tank for the last few years. I had a brief stint with Altum Angels and now I am in love with Discus. 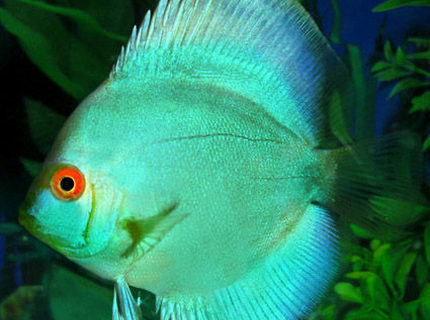 Ironically enough when I changed teh tank I was going to invest in a group of pearl gourami's thus the dark background and dark substrate. 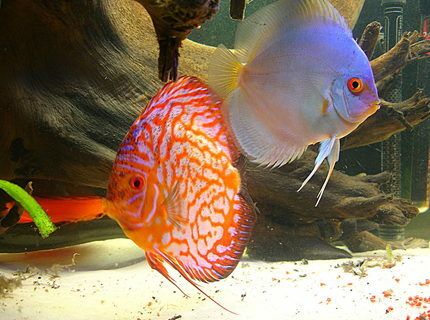 Discus usually look better (don't pepper or darken) with lighter background and substrate but they were a gift. Once the plants grow in not much of the substrate will show anyway. 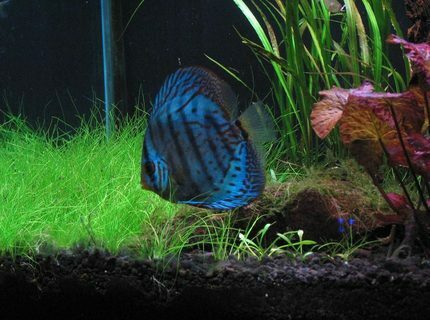 Fish Kept: Discus, a clown pleco, two panda cories and a school of Lemon Tetras. I'm also saving to buy a group of sterbai cories. There is also a lone rummy nosed tetra left. I had those for years and they began to die off. 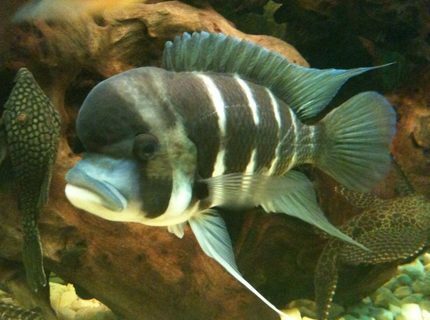 Not sure if there is an ugly old picture of a rummy under my tank somewhere this fish has to be at least 6 years old. Advice: Read, read, read. 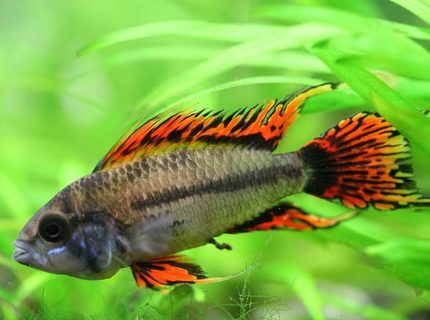 Grab every book, magazine internet article you can find on the fish and plants you are interested in. There is a lot of misinformation out there on the internet but the more you read the quicker you will be able to decipher fact from fiction. 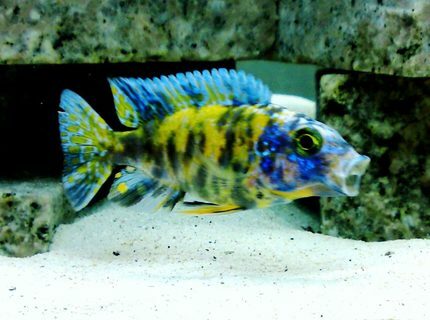 Description: Aulonocara O.B. Marble Peacock. Young one. Taken using SE 8.1mp camera phone. About Yourself: I love all animals and have many. Dogs, birds, chickens, and fish of course. When it comes to fish... 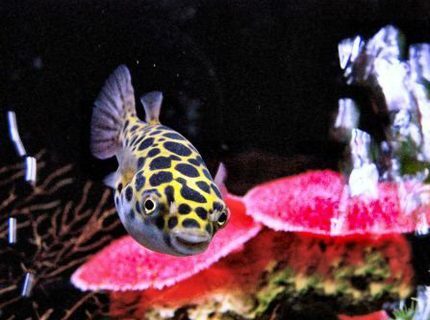 I live "in" my tank which means I understand how it works from the inside out and I get great joy fromit... I love my fishys!! !